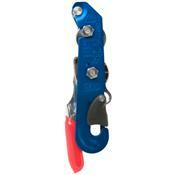 The Petzl Stop Descender is a self-locking rappel device for use on long single-ropes descents such as those encountered while caving. Squeeze the handle and it works just like a standard rappel device. When you let go of the handle, an internal cam pinches the rope and stops your descent. The Stop allows you to easily rest during a long descent and provides a safety backup.